Traditional enterprise planning efforts take considerable time to execute and forecast out years in advance. The pace of technology and change occurring across higher education has made this type of approach obsolete. However, there are ways to respond to changing conditions and align to new opportunities in a planful approach. Over the past three years we have trialed a four-step method to successfully plan initiatives for service delivery that embraces agility, ensures campus perspectives are represented and that achieve goals within short time frames. Planning before the planning by intentionally identifying team members, timeframes and scope makes the investment of your time and your team worthwhile. Tick/Tock - Creating multiple one year plans allows you to cycle between strengthening the foundation and more aspirational. Team Design - Diversity of opinions yields more robust thinking. Make sure to account for gender, ethnicity, tenure & cross function. Facilitators - An outside facilitator can bring expertise and allow you to remove yourself and your bias to help let team see this as their process and not just the leaders. Choosing Timeframe - Balance between short or long term planning process. Keep in mind that shorter process will yield less projects, where longer process may burn out staff. Utilizing existing research, establishing peer benchmarks, and engaging a variety of stakeholders in your data collection efforts will establish a broad spectrum of information, leading to a more impactful project selection. Pre-planning research - Do you already have data as an organization? Is there an ECAR survey data set that will help you? Using Benchmarks - Finding an institution that parallels your environment and interviewing them on what works for them. Filters & Scoping - Evaluate your projects against your organization’s foundational principles, existing strategic plans, or techniques like effort/impact or voting. Building a representative planning team to act as contributors/evangelists and creating a transparent communication process, with a strong message around the value of your plan, will be as impactful on its success as the content within. Cross Functional Teams - Building the team helps bring legitimacy to the process. Alder Person Role - Participation in planning is a two-way street. We rely on team members to also represent the process back to their teams. Communications - How will we reach out to the team, what frequency, what message and when? For our one year tick/tock planning cycles we focus on four to six projects for the team. This allows us to achieve the objectives within the year while allowing some flexibility as the campus spins up additional priorities that we may need to engage in. Design and Prioritization Tool: The best way to provide a world-class product/service is to identify real world challenges and provide simple solutions.To really identify real world challenges, nothing beats direct observation.Not interviewing or asking a user what’s not working, actually seeing a user in their natural setting and understanding their experience through actions.Focus on 5 levels of Why in your questioning to get to root problem/need. Design and Prioritization Tool: If you can’t spend the energy on observational research then customer interviews is next best.Again, deploy a focus on 5 levels of Why in your questioning to get to root problem/need. Design and Prioritization Tool: Utilizing the power of table conversation, the World Café process allows for you to handle large groups of people in a structured feedback session around a topic of interest. 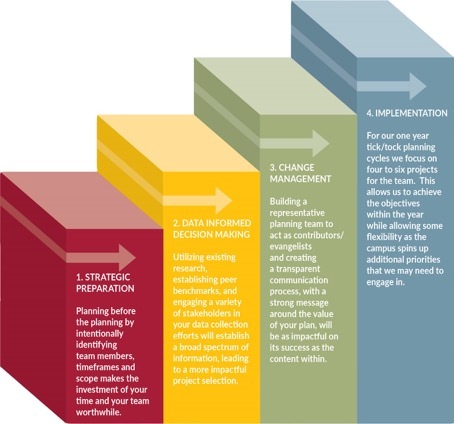 The methodology uses seven design principles to get to feedback that can be used for planning purposes. Design and Prioritization Tool:Having a standing advisory group is a great way to direct partner energy and feedback in your product.Roadmaps help here to provide some guiding framework and to direct discussion.Having group provide targeted feedback around questions of what they’d like 90 to180 days out allows the team to not have to react. Engaging a wide range of potential partners and being able to affect culture change involves getting similarly minded people together to share best practices and advice. Engaging and managing a community can provide continual feedback as well as opportunities to share news about tools and product enhancements. Did I mention clear vision and roadmap?This critical for key customers that either consume large quantities of your product but also tend to want more say in the process. Involve them in your advisory group meetings and other planning activities helps with buy in. Roadmap is a great tool here as well.Checking in helps all accounts feel like key accounts and helps keep feedback coming in to the product team.